…I am going to be a happy girl, and I am sure you guys will be too. Talk about spoiling yourself. Spa treatments. Massages. Lounging by the pool as the cabana boy brings you a martini. Pure heaven I tell you. Of course – there are a ton of activities for you adrenaline junkies, but the pampering side of it just gets me all gooey inside. Yes folks. It has happened. It only took us three months, but Chris and I have finally secured a destination for our destination wedding. YAHOO! 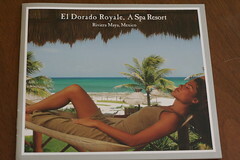 (1) Resort – all inclusive. Plethera of food, drinks, and activities without you ever needing to take your wallet out of the safe. There is also a spa for those moments you truly wish to pamper yourself. One thing of note – this is an adult only resort which I know is good for some, but could be inconvenient for others. It was a tough decision as we tried to get everything on our wish list – but realized that was impossible so we had to make compromises. (2) Accomodations – Main resort has lovely ‘reasonably priced’ rooms. There are also individual bungalows (casitas) available for those who wish to live like P. Diddy for a day (or seven). (3) Location – most everyone can get there on a direct flight with others not having more than one layover. It is also just 30 minutes to Cancun and 15 minutes to Cozumel / Playa del Carmen so we can take road trips if everyone felt the need to leave the resort for a day.